The Author’™s registration forms may require you to give the Author contact information (for example, your name and email address). If you choose to register on the Site, you agree to give the Author accurate and current information about yourself. The Author may use personally identifiable information that you provide during registration to send information to you and/or to contact you. The Author also reserves the right to use your personally identifiable information for other reasons. The Author may sell or otherwise transfer your personally identifiable information and/or aggregate information to a successor of the Author in connection with an asset sale, merger, stock sale or other transaction, in connection with the due diligence phase of such a transaction, whether consummated or not (subject to confidentiality obligations running to the recipient), or in connection with the administration of a bankruptcy estate. All information, suggestions, and comments received by the Author will be deemed to be non-confidential. The Author will be free to reproduce, use, disclose and distribute such information to others without limitation. Furthermore, if you use or post content on any public area on the Site, you should be aware that any information, including personally identifiable information, that you submit there can be read, collected, and used by other users of the Site, and may be used to send unsolicited messages. The Author is not responsible for loss of privacy or any claim relating to the information that you choose to submit by these means. The Site has security measures in place to protect the loss, misuse and alteration of the information under our control. However, the transmission of information over the Internet or other publicly accessible networks is not secure, and is subject to possible loss, interception or alteration while in transit. Accordingly, the Author does not assume any liability for any damage you may experience or costs you may incur as a result of any transmissions over the Internet or other publicly accessible networks, including, without limitation, any of your personally identifiable information. No information submitted to the Site or used in connection with the Site shall be considered to be ‘protected health information’ pursuant to the Health Insurance Portability and Accountability Act of 1996, Pub. L. No. 104-191, as amended by Pub. L. No. 111-5 Division A, Title XIII HITECH, and the implementing regulations promulgated thereunder that are more specifically referred to as the Standards for Privacy of Individually Identifiable Health Information at 45 C.F.R. Parts 160 and 164; Health Insurance Reform: Security Standards; Final Rule at 45 C.F.R. Parts 160, 162 and 164; Interim Final Rule on Breach Notification for Unsecured Protected Health Information, Interim Final Rule on HIPAA Enforcement and other privacy laws, all of which may be amended from time to time (collectively, ‘Privacy Laws’). Author shall have no liability to you pursuant to the Privacy Laws. The Author does not intend to collect any personally identifiable information from children through the Site. Individuals under eighteen (18) are prohibited from accessing the Site. Parents with children under eighteen (18) should block this Site from their browser. 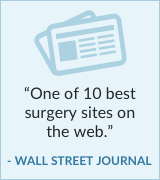 Any user who desires to review, amend or correct his or her personal information should contact us at InsideSurgery at g mail dot com.